MBTA: There are several nearby MBTA Commuter Rail Lines from North Station in the neighboring towns of Stoneham, including Melrose, Winchester, Wakefield, Reading, Medford, and Woburn. 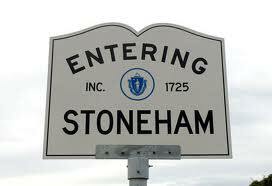 Stoneham can be found 9 miles north of Boston. It offers ideal proximity to major highways and public transportation as well as to Massachusetts’ North Shore coastal region, making it desirable for families and commuters. This city is home to Olympic figure skating medalist Nancy Kerrigan and the Stone Zoo.